This week’s WP Weekly Photo Challenge is MERGE. I like this challenge a lot, and it legitimizes what I like to do in the virtual darkroom, create mixed media from photography that I’ve shot along the way. Below is a series of original digital daytime frames that I transformed into nighttime scenes, merging the light of day with the virtual moon and the stars above and the shadows below. I know there are purists out there among you who will shout, “FAKE!,” like a prosecuting attorney pleading his/her case before the bench. Shout all you want, mixed media is an art form and I thoroughly enjoy the results it provides me. 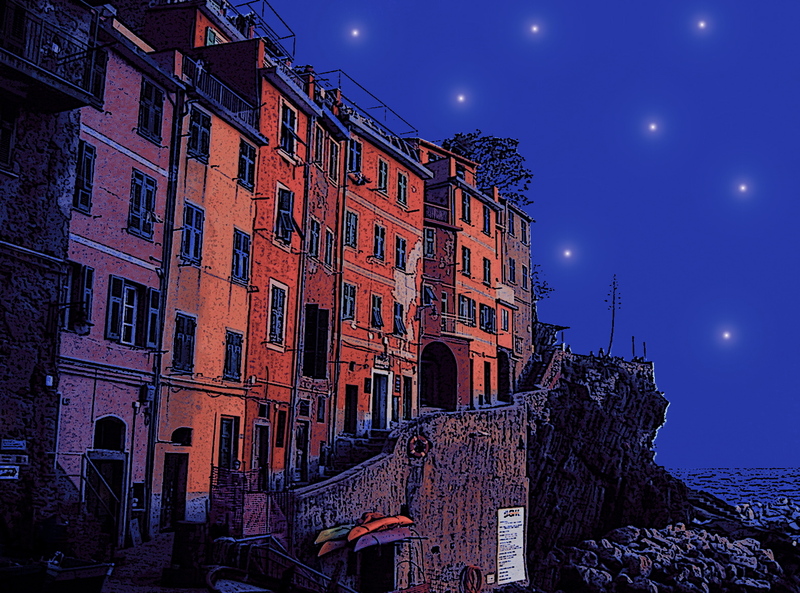 Cinque Terre Under the Stars – Rio Maggiore, one of the five villages that comprise the Cinque Terre (the five lands) – Monterosso, Vernazza, Corniglia and Manarola the remaining four-fifths – is the first of the “lands” one sees when approaching from La Spezia just to the south. The Cinque Terre is a rugged portion of coastline overlooking the Ligurian Sea along the Italian Riviera. The coastline, the five colorful villages and the surrounding hillsides are all part of the Cinque Terre National Park – a designated UNESCO World Heritage Site. Part of the charm of Cinque Terre is the lack of visible commercial development and its pedestrian-only environment. Small trains, boats and paths connect the villages, and cars are not allowed. A walking trail, Sentiero Azzurro (Blue Trail), connects all five of the villages and is partially open to foot traffic following last October’s devastating floods and mudslides. 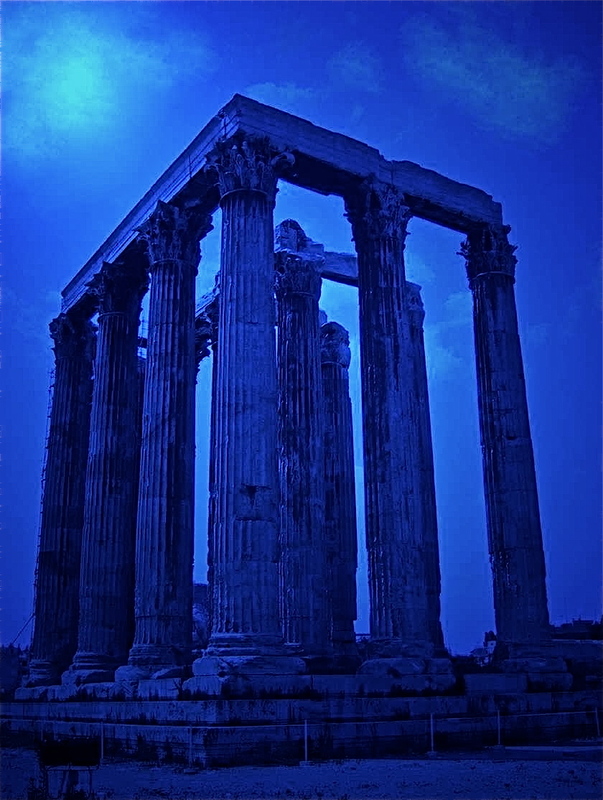 Athens at Rest – The Temple of Olympian Zeus, also known as the Olympieion, is a colossal temple in the center of the Greek capital that was dedicated to Zeus, king of the Olympian gods. Construction began in the 6th century BC during the rule of the Athenian tyrants, who envisioned building the greatest temple in the ancient world, but it was not completed until the reign of the Roman emperor Hadrian in the 2nd century AD, some 650 years after the project had begun. During the Roman period it was renowned as the largest temple in Greece and housed one of the largest cult statues in the ancient world. The temple’s glory was short-lived, as it fell into disuse after being pillaged during a 3rd century AD barbarian invasion. Following the fall of the Roman Empire, the temple was extensively quarried for building materials for projects elsewhere in Athens. Despite this, substantial ruins of the temple remain visible today as the Olympieion continues to attract tourists. 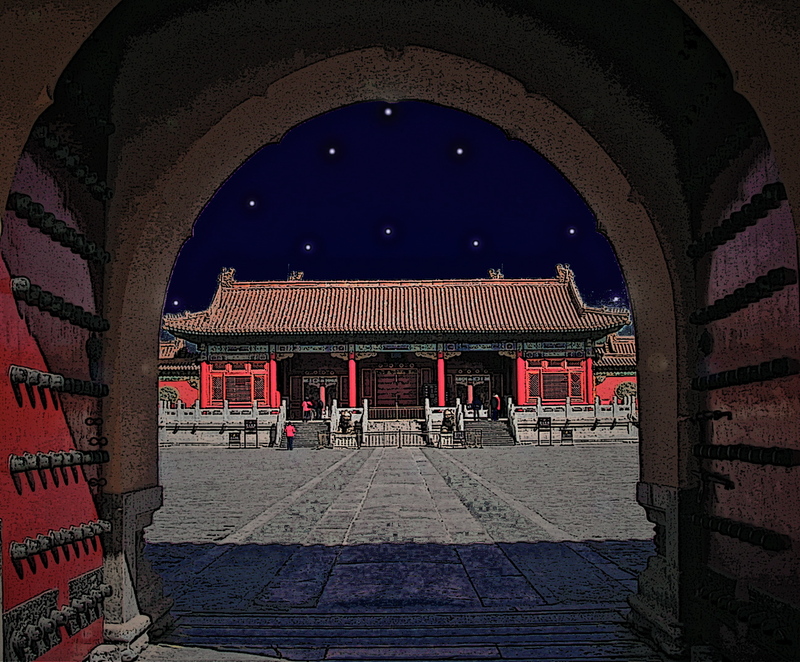 Forbidden Dreams – The Forbidden City was the Chinese imperial palace from the Ming Dynasty to the end of the Qing Dynasty. It is located in the middle of Beijing and now houses the Palace Museum. For almost five centuries, it served as the home of the Emperor and his household, as well as the ceremonial and political center of Chinese government. Built from 1406 to 1420, the complex consists of 980 surviving buildings with 8,707 bays of rooms and covers 720,000 square meters (7.8m sq. ft.). The palace complex exemplifies traditional Chinese palatial architecture, and has influenced cultural and architectural developments in East Asia and elsewhere. The Forbidden City was declared a World Heritage Site in 1987, and is listed by UNESCO as the largest collection of preserved ancient wooden structures in the world. 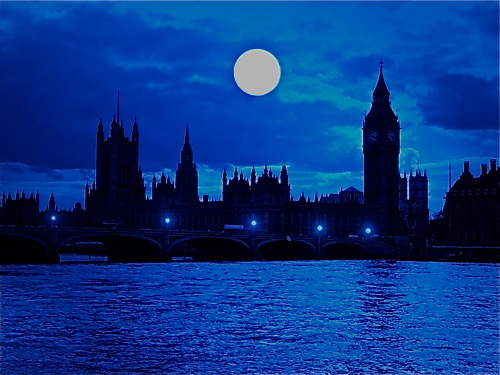 The Thames in Repose – “Big Ben” is the nickname for the great bell of the clock at the northeastern end of the Palace of Westminster in London. Built in 1859, the nickname is often also used to refer to the clock and the clock tower. This is the world’s largest four-faced, chiming clock and the third largest free-standing clock tower in the world. The bridge leading to Big Ben and the Palace of Westminster is the Westminster Bridge. Designed by Swiss architect Charles Labelye, it was built between 1739-1750. It was only the second bridge crossing to be built across the Thames below Kingston when opened. 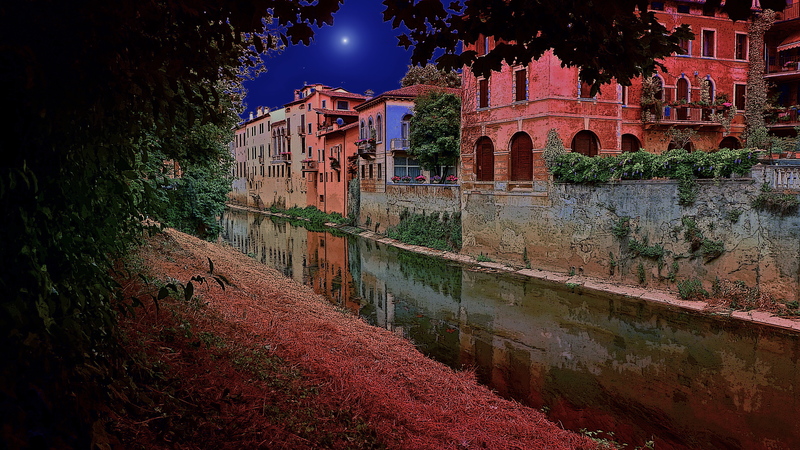 Night stills the Retrone – Colorful villas dot the landscape along the banks of Fiume Retrone (Retrone River) while it flows quietly through Vicenza, a provincial capital in the Veneto region of northeastern Italy. Moonlit Winding Promenade – La Tour-de-Peilz, an often overlooked but picturesque municipality along the shores of Lac Leman (Lake Geneva) in Switzerland, is bookended by its more famous neighbors of Vevey and Montreux. The “little hobo,” American-born actor/writer/director/producer Charlie Chaplain, and Henri Nestlé, the founder of the Nestlé food empire, called this part of the “Swiss Rivera” home. Its small port, the winding tree-lined promenade and quaint streets are what make La Tour-de-Peilz an inviting stop on a tour of the lake. 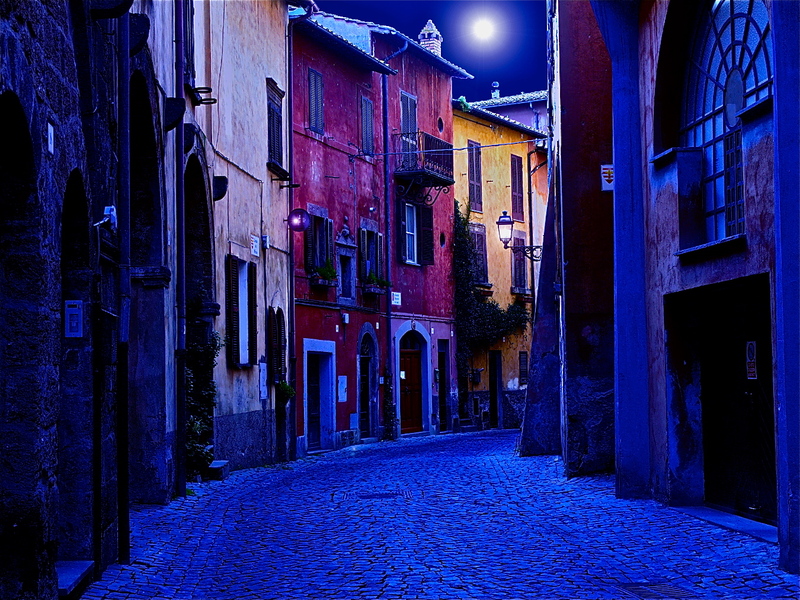 Etruscan Night – Tuscania – not to be mistaken with Tuscany – was once a proud Etruscan city. One legend has it that Tuscania was founded by Ascanio, the son of Enea, on Mars’ advice that he would build a city on the very site where he would find a dog with twelve puppies. Hence the Etruscan name Tus-Cana (“Cana,” Latin for dog). Another legend claims that the city was founded by Tusco, the son of Hercules and Araxes. Regardless of its disputed “founding father,” the center of Etruscan life was here, in Tuscania, in the Lazio Region of central Italy. All Roads Lead to Hang Dao Street – This is one of Hanoi’s oldest and busiest streets. Motorbikes remain the most common way to move around the city. For short trips, xe ôm (literally, “hug vehicle” or motorcycle taxi) are available; just be sure and “hug on” on for dear life. 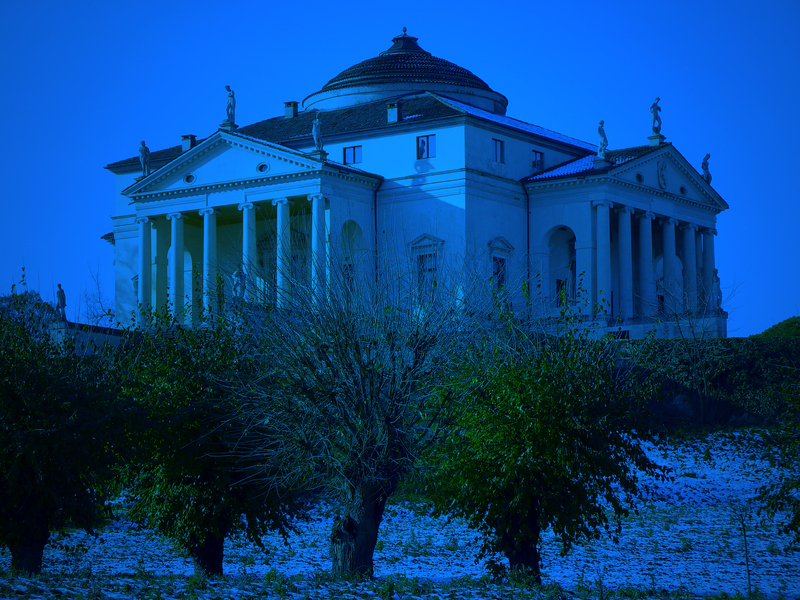 Palladio Sleeps – The Villa Almerico Capra – La Rotonda – master Renaissance architect Andrea Palladio’s crown jewel to the world, is the benchmark of modern-day architecture known as the Palladian style. Not just a villa sitting at the foot of the Colli Berici (Berici Hills) in Vicenza – Citta’ di Palladio – in Italy’s Veneto region, La Rotonda is much, much more. Since its creation in the 16th century, poets and artists, sovereigns and statesmen, scholars and art historians, and travelers and tourists have visited this UNESCO World Heritage Site from every corner of the globe. Thomas Jefferson, one of the Founding Fathers of the United States and its third president, and an architect of note himself, modeled his Virginia estate, Monticello, after Palladio’s masterpiece. After more than five centuries, La Rotonda remains a place of beauty and continues to inspire even while the master sleeps. Next PostSAINTS AND TRUFFLES AND WILD BOAR, OH MY! I love the one on the banks of the retrone river!! Thanks for stopping by to take a peek and your favorable comment on the Retrone River frame. However I like “Venezia Sotto La Luna Blu” most.